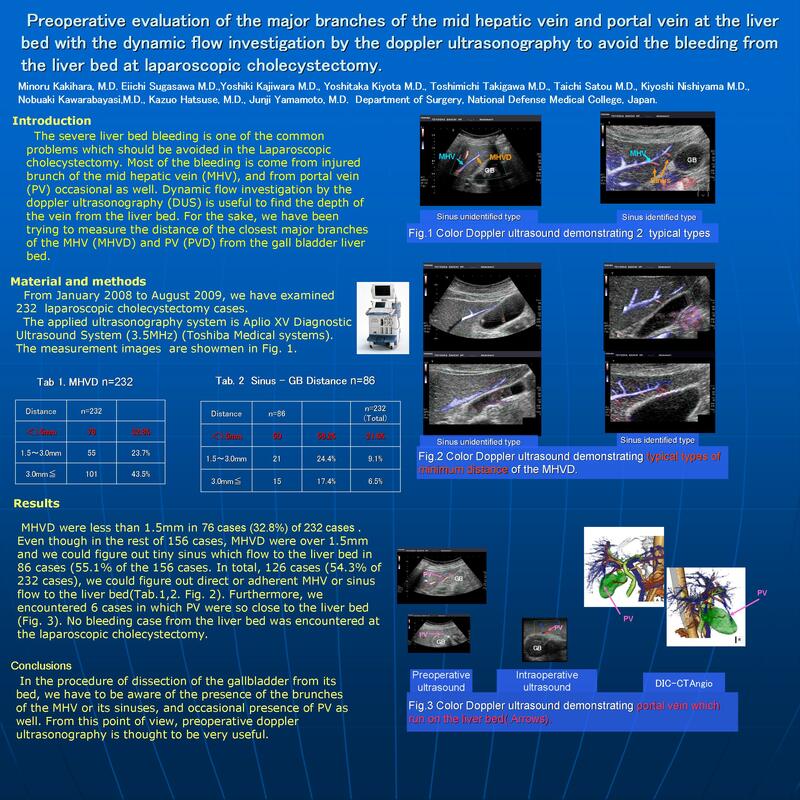 Preoperative Evaluation of the Major Branches of the Mid Hepatic Vein and Portal Vein At the Liver Bed with the Dynamic Flow Investigation By the Doppler Ultrasonography to Avoid the Bleeding From the Liver Bed At Laparoscopic Cholecystectomy. Introduction: The severe liver bed bleeding is one of the common problems during the laparoscopic cholecystectomy. Most of the bleeding is from injured middle hepatic vein (MHV), and from portal vein (PV) occasional as well. Dynamic flow investigation by the doppler ultrasonography (DUS) is useful to find the depth of the vein from the liver bed. For the sake, we have been trying to measure the distance of the closest major branches of the MHV (MHVD) and PV (PVD) from the gall bladder liver bed. Materials and Methods: From January 2008 to August 2009, we have examined 232 laparoscopic cholecystectomy cases. The applied ultrasonography system is Aplio XV Diagnostic Ultrasound System (3.5MHz) (Toshiba Medical systems). RESULTS: In 76 cases (32.8%), MHVD were less than 1.5mm. Even though in the rest of 156 cases of the MHVD over 1.5mm, we could figure out tiny sinus venous which flow to the liver bed in 86 cases (55.1% of the 156 cases). In 126 cases (54.3% of 232 cases) we could figure out direct or adherent MHV flow on the liver bed. Furthermore, we encountered 6 cases in which PV were so close to the liver bed. No bleeding case from the liver bed was encountered. CONCLUSIONS: In the procedure of dissection of the gallbladder from its bed, we have to be aware of the presence of branches of MHV or its sinuses, and occasional presence of PV as well. From this point of view, preoperative doppler ultrasonography is thought to be very useful.